Don’t judge a book by its covers … this applies to the entire country of Cuba.Walking down the gray streets of stone in Trinidad, I thought how cold stone is visually. Suddenly, like magic, it was time for the cafe owners, the shop keepers, and people in general to open their shuttered tall windows and doors, and color appeared. Before I took a photo of an interior I asked the person there if it was permitted to do so. They all gave me a “go ahead” smile and here are the results: a living room, an art gallery, a hat shop, a restaurant … and this was only one block! Some are sumptuous, some are restrained, but all show a great deal of thought has been put into form and color. Enjoy the ebullient feel of Cuba! Walking through the landscaped grounds of a resort we see a robin-sized bird hopping around the corner of a building. Snapping to ALERT we begin sneaking slowly toward the corner. Carrina and I put our heads around the edge and a Red-legged Thrush comes into focus. Our Cuban guide said he is hard to see as he is usually lurking in underbrush. Here he is in an open area with the sun shining on his red legs. They are neon red! His matching red eye is clearly outlined. We high five and glance around … there are three chambermaids, loaded with sheets, standing still with their mouths open and their eyes wide in concern looking at us. We wave and gesture at our cameras and try to reassure them we are harmless. They relax, smile, and scurry on to their jobs. Our sneaking must have been convincing! In contrast to the Bee Hummingbird, the Tody weighs 2 ounces. It is approx 4.3 inches long. This elusive little beauty hangs out high in trees … at least he did when we tried to get a photo of him. They are difficult to see but patient waiting will pay off handsomely when you spot this vibrantly colored bird. He is endemic (native and restricted to a certain place) to Cuba and a few islands around Cuba. Having seen this minute bird for myself it is still hard to believe that it weighs from 0.056 to 0.071 ounces. Less than an ounce and still it zooms thru the air sipping nectar from flowers with abandon. His name in Cuba is Zunzun or better yet Zunzuncito. He sports iridescent feathers called a gorget hanging from his throat. I am at the house of Sr. Bernabe who hosts the international visitors who come to visit the Zunzun and to watch them sip from the flowering tree in his back garden. He graciously fills a feeder and holds it up so the Bee Hummingbird comes to eat and is available for photos. A mesmerizing hour is gone in a flash and we must leave. What a treat! Gracias! As summer winds down, the butterfly finds fewer flowers to sip from and, when the first hard freeze arrives, it is preserved in ice to be discovered the next spring. Such a contrast from the sunny days of summer when this fragile-winged creature flits through fields of flowers completing its life cycle and assuring new generations of butterflies. The revolving wheel of life! 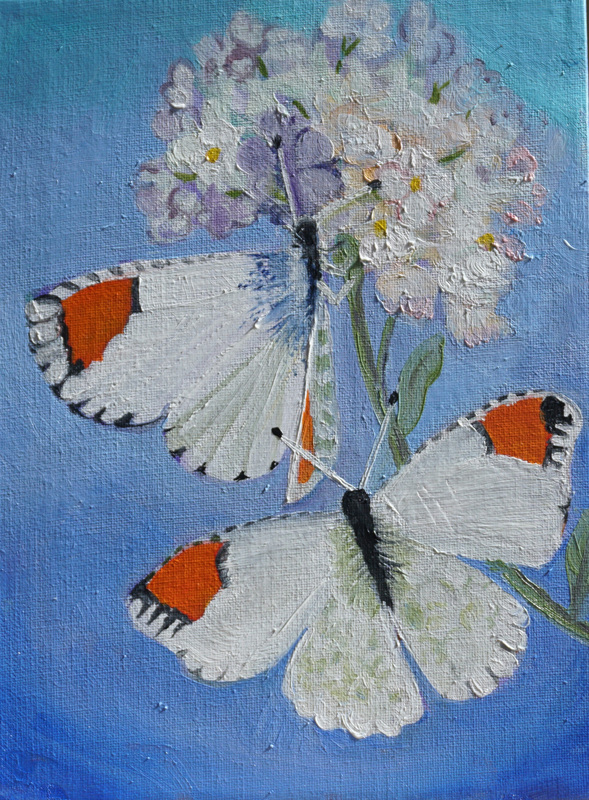 In the time of dinosaurs (150 million years ago) there lived the ancestors of the modern butterflies called Lacewings. When the impression of a Lacewing was discovered pressed into stone the finder/scientist cleverly took tiny bits of the stone and ground it up to examine it and determine the color of the eye spot and wings. Here is my imagined re-creation of the lacewing based on his findings along with a photo of the Red Admiral butterfly currently seen in the Rio Grande Valley. Hawaii was surprisingly forested on the “wet side” of the Big Island. We hiked into the Forest Reserve hoping to see the Red and Yellow Honeycreepers. With luck and patience we saw them in the tops of the O’hia trees. 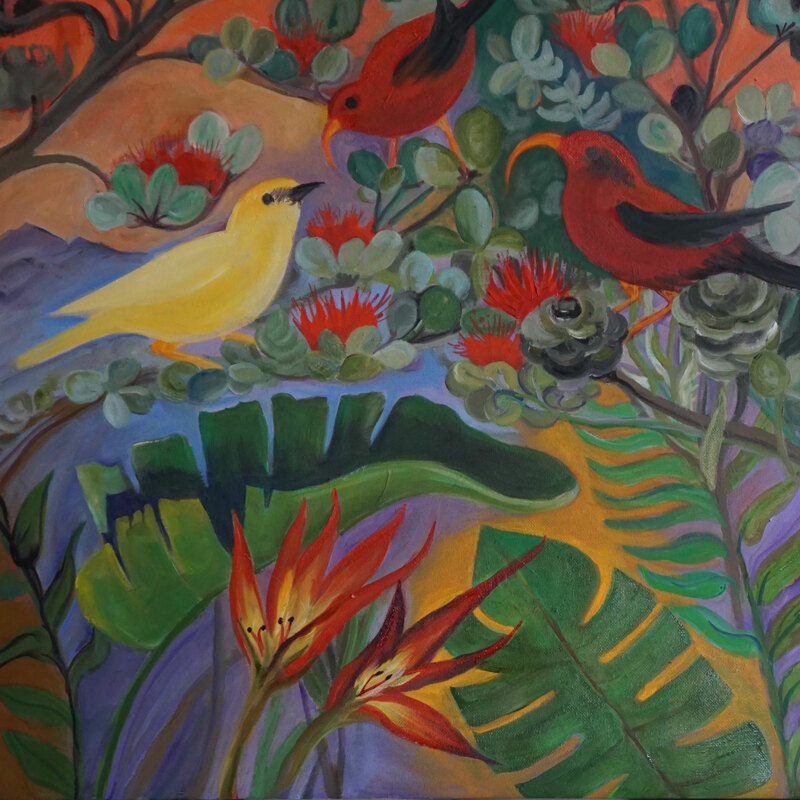 In order to see the tops of the trees, Carrina hiked into an old crater which over the years had filled in with trees down in the bottom … as you stood on the lip of the crater looking down into it you saw the O’hia tree tops with birds sipping on the O’hia blossoms. This painting reflects my impression of Hawaii. 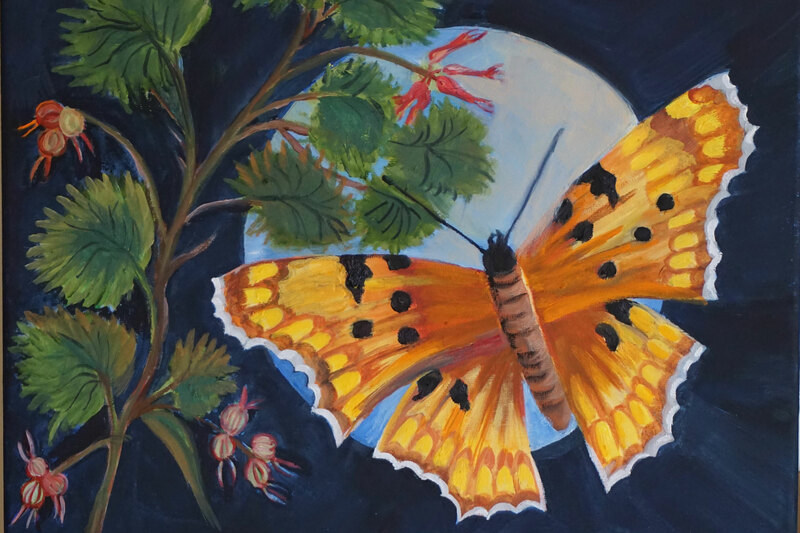 A continuation of my butterfly paintings inspired by the Desert Orangetip seen at the top of the Sierras … he must be lost as this is not desert but there he was! Flitting around the Red Currant bushes was a gorgeous Hoary Comma with his lacy wing edges. He lit … he posed … a click of the camera and I could examine him in detail. Beautiful markings. A consideration of time is what this painting is about. 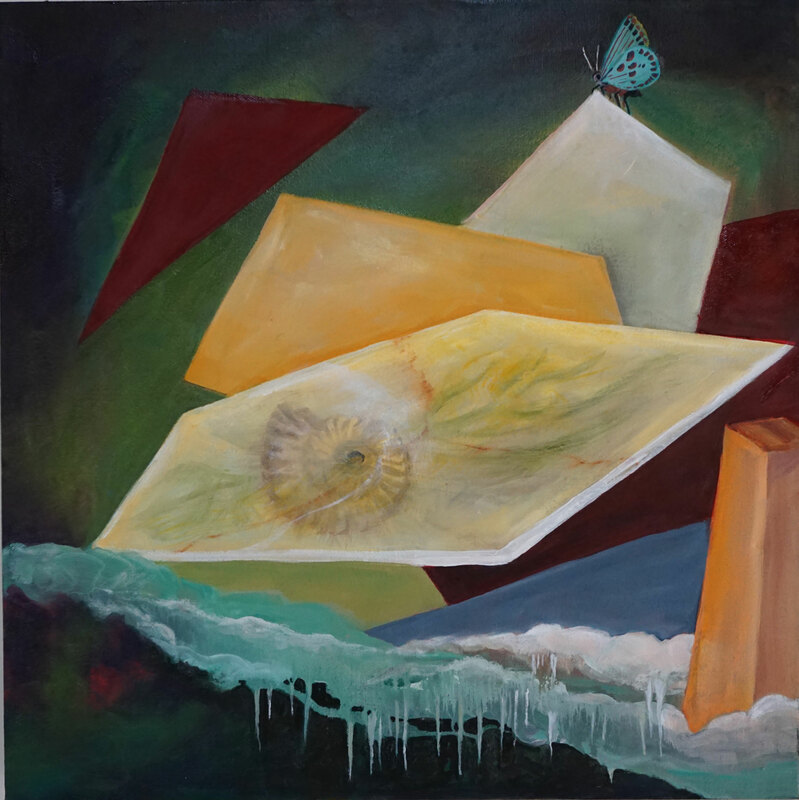 It is titled “landscape of Stark Choices”. There is a fossil shell and a living butterfly connected by eons of time.